Jose Frausto, left, is a technology teacher at Enrico Tonti Elementary School. I attended a neighborhood public school in Chicago where, from a very early age, I felt the difference between technology haves and have-nots. Why is it that, in an era of mobile computing, “freemium” apps and high-speed internet, our poorest students still lack access to the basic technology and tools they need to help them succeed? Like many low-income public schools in Chicago at the time when I was growing up, my elementary school had a single computer lab equipped with desktop computers. And that lab wasn’t for everyone — it was only used by students who needed to do remedial, catch-up work. The first time I used a computer wasn’t until eighth grade, through a program for high-potential students that was designed to provide us with some exposure to technology before we entered high school. I went on to enroll in Whitney Young High School, a selective-enrollment school. Suddenly, technology was everywhere. We had two computer labs, a TV production lab and a media lab. It was an amazing transition that made me feel empowered and trusted. For the first time, I was in control of where my future was going — because I had the right tools at my fingertips. This is where my passion for education began, and part of what drove me to become a teacher. I knew — even then — that if more students had access to these kinds of resources and experiences, it could be a game-changer for their future even if they came from impoverished backgrounds. For the past 13 years, I’ve been teaching at Enrico Tonti Elementary School in Gage Park, a school that has the luxury of providing our students — most of whom are lower-income Latino children, a third of them English-learners — with access to technology. For many of our children, school is their best opportunity to learn how to use technology. To offset tight budgets, we have applied for grants and other assistance whenever possible. The effort has been worth it. And Tonti has experienced academic success: Our school is a Level 1 school, and our test scores, especially in math, are higher than the national average on the NWEA, the major test the district administers each year. Students use technology during the day to work on self-paced learning programs tailored to meet their current academic skills and help them achieve their potential. Starting in kindergarten, students learn how to handle devices, type and even code. Eventually, students learn to create digital content, and by fifth grade, they design their own websites. In a survey we gave, nine out of 10 students said that they pay more attention and focus better when using technology. Enrico Tonti is proof that technology can help students succeed. Although our school district has come a long way since my time in elementary school, there’s still more we can and must do to narrow the technology gap. In a city where poverty and crime are closely linked, we must find ways to engage those of our young people who need opportunity the most. It’s the only way to bend the curve of systemic poverty and make our city safer and more prosperous. Of course, technology is not an end in and of itself. It will not address the range of social and educational challenges our children face, inside and outside schools. But we must be aware of the message we are sending to our students if we fail to address the access barriers that exist within our system. Let’s be sure we are not forgetting our city’s most vulnerable youth, and that we are equipping them with the tools they need to succeed. We’ve made some progress since my years as a student, but our work is not finished. 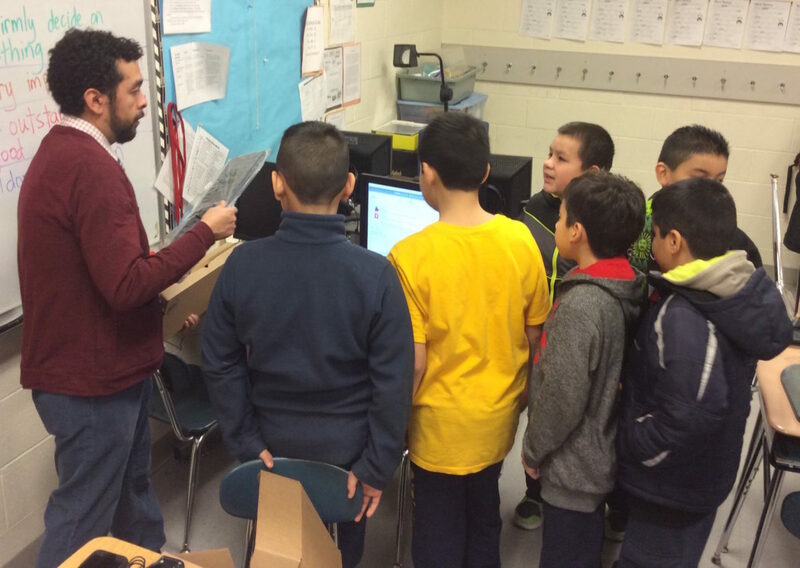 Jose Frausto is a technology teacher at Enrico Tonti Elementary School, chosen as an Innovative School of the Year by CPS. He also contributes to the Smarter Schools Project, a national forum highlighting the positive use of technology in the classroom.